It’s 7 p.m. on a Thursday evening and the hairstylists at Salon Dominicano are nowhere near being done for the day. Sobeida Sanchez finishes a relaxer. Mary Martes unveils a client's beautiful waves after a roller set. The salon's new name and exterior drew a lot more customers. Mary Gil does a blowout. Mary Gil (with long hair) and Irene Sanchez taking out a client's rollers after time under the dryer. 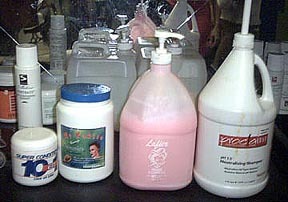 Some popular Dominican products, including the famous pink cream rinse, Lafier Desrizol Rinse. Stylist Irene Sanchez asks me if I want my hair done right then, after I’ve completed my interview. I decline, but promise I’ll come back very soon. I want to experience for myself what it's like ot get my hair done at a Dominican salon. Salons operated by immigrants from the Dominican Republic and their descendants have earned a positive reputation among clients for their styling methods and treatment of thick wavy and curly hair -- and often for less than typical salon prices. Fans praise the rich conditioners used in the salons, yummy concoctions that can include carrots, avocados, honey, milk and almonds among the ingredients. 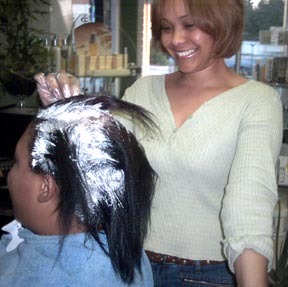 Hair straightening methods used in Dominican salons are also considered to be gentler than the typical flat iron method. Known alternatively as a blow out or blow dry, a stylist usually wraps a client’s wet hair onto extra-large plastic rollers. After finishing the head with about 10 rollers overall, the stylist places a black net over it and places the client under the dryer. 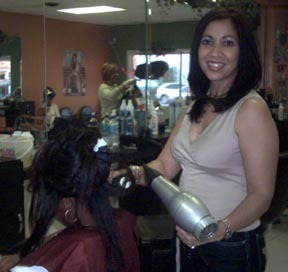 After the hair dries, the stylist removes the rollers and in some cases, takes a hot hand-held dryer and places it close to the roots, making sure they stay straight. Irene said the salon focuses on maintaining healthy hair -- “We want the clients to come back,” -- so preparation for blow dry, color and chemical services is a must. If a client’s hair is damaged, a stylist won’t provide a color or relaxer service that day, but instead do a series of deep conditioning treatments before having her come back for a chemical treatment, Irene said. Sobeida Sanchez was born in the Dominican Republic, a Caribbean nation that shares an island landmass with the country of Haiti. She worked as a stylist in New York, and after moving to the Orlando area 16 years ago, she saved money to start her own salon. In 2002, Sobeida’s dream came true when she opened a salon on West Colonial Drive, one of the area’s busiest thoroughfares. She named it Empire Beauty Salon, reflecting her New York background. Orlando residents obviously weren’t impressed. Sobeida decided a name change might be in order late last year. “Why don’t I use my country name?” she remembered thinking. With that, Sobeida put a bright red awning on the small building featuring the red, white and blue of the flag of the Dominican Republic. 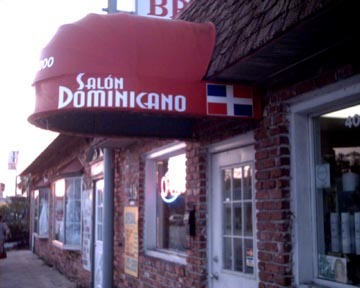 The new name, Salon Dominicano, let passerbys know exactly what they would get if they walked in. It worked. Business skyrocketed, Irene said, as people familiar with Dominican styling processes and products finally knew where to find them in Orlando. The sign attracted Laurie Morgan, an African-American woman who had gone to Dominican salons in New York. She couldn’t find a similar place in Orlando until she saw the awning while driving down Colonial Drive. Morgan immediately stopped at the salon and made an appointment for a relaxer. In Altamonte Springs, outside of Orlando, I also discovered a Dominican barber shop called Mr. Eli’s, which employed one womens’ hair stylist named Felicia. Like Salon Dominicano, the atmosphere was welcoming and Felicia was more than willing to talk about her products and styling methods. Dominican salons are becoming more popular in Florida, with South Florida (Miami-Ft. Lauderdale-West Palm Beach) and Central Florida (greater Orlando) boasting the largest Dominican populations in the state. Florida, however, is far behind places like New York City, where entire blocks are filled with Dominican salons and beauty supply stores. Residents of other Northeastern and Mid-Atlantic cities such as Boston, Providence, R.I., and Washington, D.C., can probably find a Dominican salon or beauty supply store not too far away. Thanks to the Internet, however, it’s now possible to buy Dominican products no matter where one lives. The site Sickbay, located in Miami, has one of the largest selections of products used in Dominican salons and even lists the ingredients for some items. Also included are Salerm, a brand from Spain, and Alter Ego, an Italian line. Although not technically Dominican, the lines are popular in Dominican salons and are often included in the family of Dominicanproducts. Dominican salons and products might not work for everyone, however. While the stylists are familiar with a variety of hair types, visitors have noticed that it’s uncommon to see workers doing styles designed to enhance curly hair. During my visit, for example, everyone appeared to be getting some form of straightening or blow-drying service done. In addition, Dominican and Dominican-affiliated products might not be the best solutions for all curly heads. Mineral oil and proteins are included in a number of Dominican products and some companies don’t list ingredients at all on their bottles. For those with fine or wavy hair, the Dominican treatments could be too heavy.Then there’s the language barrier present with some stylists -- it may be difficult for a non-Spanish speaker to communicate exactly what she wants if her stylist isn’t proficient in English. That didn’t seem to be a problem for Morgan and other non-Spanish speakers in the salon that day, but some posters on Internet hair boards have complained that their requests weren’t understood when they visited Dominican stylists. At Salon Dominicano and Mr. Eli’s, the stylists do their best to speak English to clients who can’t communicate in Spanish. But the most important form of communication, they prove, is listening to their clients’ hair.